For Christmas we baked a wonderful yummy ham. But since there is only three of us, and one is pint-sized, we have a lot of leftover ham. Good thing I have a set of leftover ham recipes that go beyond the basic ham sandwich. There are not a lot of pictures with this post so you will have to use your imagination a bit. 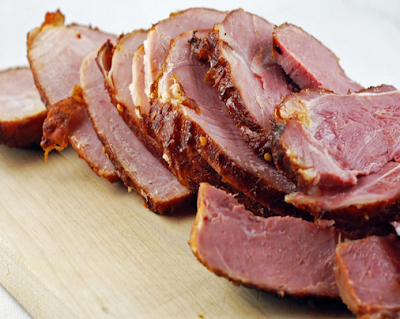 I hope these recipes and ideas inspire you to use up the rest of your leftover ham! In a skillet add the olive oil and chopped veggies. You do not have to use the vegetables listed above but can throw in any combination you happen to have on hand. Once the veggies are softened, add the chopped ham and cook until the ham is warm. While cooking, put the eggs and salt in a bowl and beat with a whisk or fork until well combined. Move the veggies and ham to one half of the pan. Add the butter to the now clear half of the pan. Spread the melting butter around to coat that half of the pan. Add the eggs to the clear, now butter coated half of the pan. Use a spatula to continuously scramble eggs in the pan. Once about half of the egg is cooked, combine the eggs and the veggie/ham mixture and continue to scramble another minute or two. Do not over cook the egg. Transfer to a plates and serve immediately. Scrambled eggs, contrary to every restaurant buffet, do not sit well. My egg bake recipe is here. Instead of using sausage, use ham. Super yummy! This recipe does not need to have the hash brown crust. It can be cooked directly in a greased pan instead. I made this the other night. Again I wish I had thought to take pictures. Blogging is going to drive me to capture pix of everything I cook, just in case. Well my family seems to understand... or they are afraid and don't want to startle me in someway. Bring your 6 cups of water and 1 teaspoon of salt to a boil in a medium sauce pan. While the water is heating, wash and peel the potatoes. Slice the potatoes into 1/4 inch thick slices. Then cut all the slices in half. Once the water is boiling carefully add the potatoes to the boiling water (please wait until boiling). Reduce heat to a simmer to prevent bubbling over. Gently boil potatoes about 10 minutes. This will significantly cut down on the oven cooking time. It drives me crazy that every Au Gratin potato recipe has a 50 to 60 minute cook time when it really is more like 1-3/4 hours to get the center potatoes truly soft and cooked through. Drain the potatoes into a colander in the sink. Let them sit a few minutes to really drain off the water. While waiting, in a bowl whisk together the milk, cream, salt, and garlic or onion. You can add pepper to this mix too if you like. Butter the bottom of your baking pan. Take about half of the potatoes and add them to the pan then layer with about half of the chopped ham. On top of that add about half of the milk and cream mixture. Then repeat with the remainder of the potatoes, chopped ham, and mix and cream mixture. Put in the oven for 30 minutes, uncovered. After 30 minutes, add the shredded cheese and cook another 20 minutes until browned and bubbly. Let set about 5 minutes before serving. I mention this here as a place holder. I will be making this later this week and will post the recipe specifically. And will take pictures this time! Update: This recipe has been posted. Find it here. Prepare pasta until cooked al dente (in other words until not quite done and still chewy). Drain in a colander over the sink. Let sit a few minutes to drain well. While pasta is cooking in a sauce pan melt butter then add garlic to cook 2 or 3 minutes. Add milk and cream and whisk together then cook until just simmering. Whisk in Parmesan cheese and remove from heat. Grease a baking pan. Add cooked pasta and ham then cover with cream sauce you made above. Last top with the shredded cheese. Bake 30 minutes until top is browned and the sauce is bubbly. Classic comfort food! Happy eating. Please follow me on Facebook, Pinterest, and Bloglovin. These are wonderful ideas of what to do with leftover ham. Don't forget split pea soup, one of my favorites. Happy New Year. Oh that is a good one. I might have to add it to the list! Thanks for stopping by! Hi Sharon. Thanks for stopping by. I need to make myself lists like this because every year I run into the same problem of what to do with all the leftovers. Now I need to make a recipe list for leftover turkey! That ham and eg casserole looks fantastic. Hope you have a great day! Thanks Heidi! I appreciate you stopping by and leaving a comment. I may just have to bake a ham to make these I credible looking recipes! Hi Adele. They sure are yummy. Thanks for dropping a line. Seriously yum these look great! I will have to try them! Hi Sheena. Thank you for taking a look and leaving a comment. I am going to take a peak around your blog too. I love the name! Ooooohhh, ham and potatoes Au Gratin! Sounds delicious! It really is super yummy Rachel and easy to customize for your own family's taste. Your ham and egg bake sound wonderful! Thanks for linking up at the 1st Wonderful Wednesday Blog Hop “2014″. Happy New Year Diane! Thank you for stopping by. I made ham and beans today and I think I'll try the egg/ham bake. I can probably freeze that, don't you think? Thank you for the recipes. They are needed and much appreciated. :) Happy New Year. I found you via Sumo Sweet Stuff block party. Hi Michal. I think you could freeze the ham and egg bake but I would leave off the cheese topping until just before you cook it. The cheese freezes just fine. But it falls all over the place when unwrapping the frozen meal and just makes a mess (kind of like opening a frozen pizza). Have a Happy New Year! These look delicious... especially the ham & egg bake! Thanks for sharing at Wonderful Wednesday! Hi Debbie. Thanks for stopping by! Happy New Year. Yum! I just used leftover ham in our black eyed peas for New Year's!! I am going to hang on to a couple of these...they look so good. Thanks for participating in our blog hop!! Love blog hops Pam! Thanks for stopping by and for hosting! I love ham and potatoes together. They just seem to fit together so well. Thanks for sharing your leftover ideas at Motivation Monday! Barb I think ham and potatoes are comfort food at its finest. Although the ham with the mac and cheese is pretty comforting too! So your a good cook too! I love having new ideas to make, and I am willing to try most things at least once! Glad to see you again Roxy. Let me know how the recipes turn out for you! This sounds wonderful even though I did have too much holiday. Thanks for sharing these recipes. One of my 2014 goals is to stop wasting food so I'm on the lookout for ideas to use up leftovers. Oh I hear you Patti. I am trying to get all my recipes down in one place (not just in my head) so that I can remember all the options I have before my leftovers get tossed out. Have a great day and thank you for stopping by. Can't wait to try the Ham Mac and Cheese! Great combination. I've got leftover ham to use up, too. Found you at Imparting Grace's link party. Glad to have you here Calista. The ham mac and cheese is classic comfort food. Great for a cold winter day. AND the best part is my 6 year old will eat it happily. Your Ham Mac and Cheese recipe sounds really good. A perfect meal for us in New England this weekend as it will be below 0. Exactly what I needed...I still have ham to use up & that casserole looks great! They all sound YUMMY! Thanks so much for sharing at AMAZE ME MONDAY, hope to see you often in 2014! Love these ideas - we always do a split pea soup with our leftovers. Thanks so much for linking up to the Friday Food Frenzy, hope to see you back next week! That ham and egg bake looks amazing! I am going to have to try that. The ham and bean soup is yummy and the Alfredo with ham too but I like to add chicken to make it a cordon blue pasta. Thanks for sharing all these great recipes in one spot. Gotta love those large roasts that stretch for several meals! We just finished the last of our New Year's ham this week. Thank you for sharing this with us at the HomeAcre Hop. We'd love to have you back again tomorrow. I like roast very much. Thanks for your variety food guides.